Rohith was not a coward even when his last act showed that he had lost hope from all corners perhaps including his own people who he might have thought would help him. We are happy that teachers are not taking classes and seeking revocation of the suspension of these students but why has it taken so long since August. Can’t we understand and read the young sensitive mind which comes under tremendous pressure with loads of hope from families that their children will study and will get a job. Definitely many become vocal in politics and social movements which are important but none can deny that the hope and aspirations of their parents is that they will study and find stable honorable lives for them. 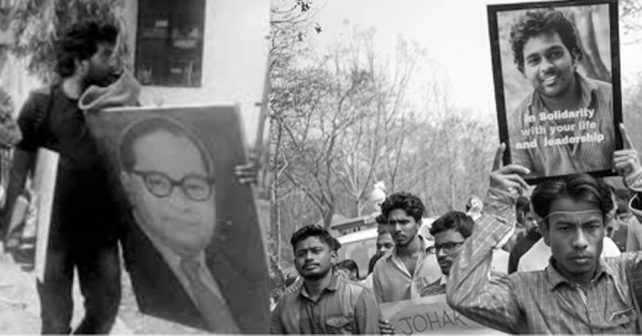 Hence, Rohith did not get justice from the University, which remains absolute brahmanical in nature with Dronacharayas sitting and wanting everyone to become an Eklavya. After May 2014 elections, the Hindutva forces have been active in the University campuses all over the country as education is the most important sector for the Sangh Parivar. ABVP is hyper active and they are after all those who differ with them. Sub-altern students, hailing from ‘servile classes’, (an umbrella term offered by Dr.Ambedkar to all non-brahmins) have become the ‘biggest’ ‘threat’ for them. The Hindutva was quite comfortable with the upper caste seculars who did not change radically. The left associations and student Unions in the past had been anti reservationists and therefore there was a huge credibility crisis particularly whenever question of their relationship with the Dalit Bahujan organizations. 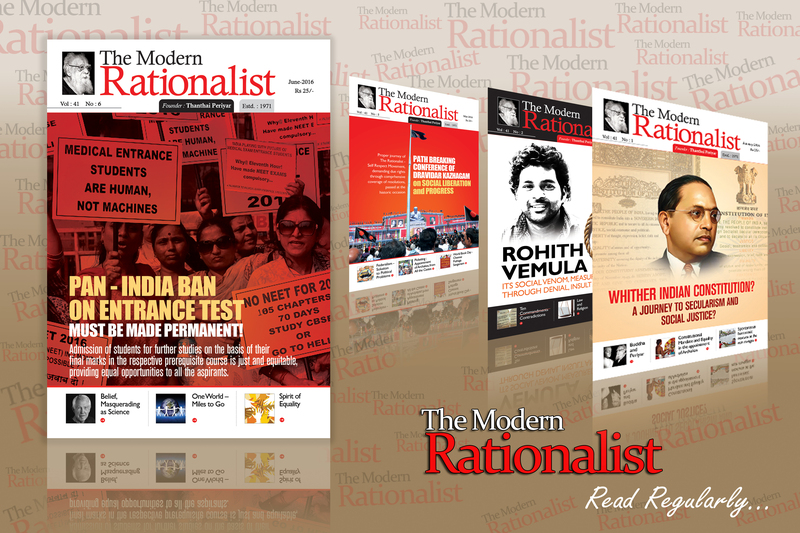 The Ambedkarite-Periyarist-Phule-ite Bahujan philosophy and social action has revitalized the entire movements and they become the real challenge for the brahmanical elite class who are ready to discuss ‘pros and cons’ of ‘international terrorism’, American imperialism and capitalism but glorify ‘Indian’ culture as the ‘most’ ‘tolerant’. Today, HRD Minister Smriti Irani said this is not a caste issue. BJP is trying to convey that Bandaru Dattratreya is a backward caste person. A TRS MP said on TV that the Rohith was not a Dalit. What do they want to convey. They say that Rohith has not charged any one in his letter written before suicide and that he was suffering from depression. We want to ask who called Rohith anti national? Why is the Sangh Parivar not allowing students to organize seminars, conferences of their choices including film, Mujaffarnagar baki hai when they can bring a Subrahmanyan Swamy to Delhi University and organize a seminar on Ayodhya. The entire government machinery is clearly visible here in the service of brahmanical forces and the real threat for them come from the Ambedkar-Periyar-Phule discourse and therefore attempt to deify Ambedkar and deny his literature to people and crush the spirit of those who swear by his idealism. Rohith’s letter to Vice Chancellor on December 18th is widely been ignored where he calls him worst than Donald Trump and asked him to give suicide pills and a rope to all the Dalit students so that the University can live in peace. This is a castigation of the entire structure of Hyderabad University, which has seen shameless caste discrimination over the year. Sangh Parivar’s lie machine is at work. Having been exposed on the issue of their anti-Dalit stand, they are now trying to save face and charging Rohith and other students with various charges including being arrogant and terming every one as ‘brahmanical’ who disagree with them. The fact is that Rohith’s letter to vice chancellor is an eye opener and it is surprising why the VC did not even bother to speak to him and other boys. Was it because they were Dalits and particularly Ambedkarites? The worst part is the Hindutva machinery outside is terming now that Rohith was suffering from some mental disorder or depression because his friends had not supported him. Whether Rohith’s friend supported him or not is another matter but in this case the Hindutva’s monsters cannot shy away from the fact that they are prima facie the people who were responsible for his death. The Vice Chancellor of the University was simply an administrator who did not stand in front of the pressure being put by the political leaders and a letter from HRD minister was treated like an order. Today, many in the media are crying how a Dalit student has faced the wrath. Some are suggesting that this is not caste violence but a case of two groups fighting with each other and political leaders jumping in to support their group. This is a clear attempt to deflate the whole issue of caste prejudices prevalent in our institutions. Sangh’s open agenda is to kill the rebellion spirit among students particularly those with Ambedkarite stream hence it is working on multiple agenda. As Dr.Ambedkar said, he would love if there were Voltaire’s here who could dissent against the brahmanical hegemony, which that was complete. Today, this hegemony is being challenged by none other than young revolutionary Ambedkarites who did not pick up guns but who with their thoughts and ideas have become the biggest dissenters of our time against Brahmanism which is being claimed by Bandaru Datratreya and others like him as being ‘anti national’. Yes, speaking against brahmanical crookedness in India is next to being anti-national in the eyes of those who did nothing except selling this nation to foreign multinationals and were absolutely absent during our freedom struggle. The education system suffers from the Dronacharya syndrome. The teachers don’t want Dalit students. If they are there, they want to make them ‘mainstream’ which means you don’t ask any uncomfortable question but most of the time complains about you. Go to any university and seek the books of social sciences. How many of our students in the schools and colleges know about Savitri Bai Phule, Joti Rao Phule, EVR Periyar, Sahu Ji Maharaj or even Bhagat Singh. All the students have known to these icons through their socializing and external efforts and not through our regular curriculum where you find Gandhi, Ram Mohan Roy, Vivekananda, Dayananda Saraswati and many more. Ambedkar is reduced to the constitutional drafter and Bhagat Singh, a hotheaded person who disagreed with Gandhi. Definitely our educational institutions are under the brahmanical assault which got emboldened under the new power elite took over India but Rohith’s death has a lot to be answered by all others who were the close associate. Many friends suggest he should have fought but we must realize he was fighting since August so what has happened? Why did he commit suicide? Why did he write that he is still alone and felt unwanted since childhood? Sub-altern students need peer support groups who are in effective positions around them, who can guide them and resolve the issue through negotiations or even by approaching to right authorities or courts. Young minds cannot sit on indefinite dharnas in front of those where none listen to you, this deaf and dumb government but from our side, we cannot afford to lose them and hence it is the duty of those who can influence administration and staff locally. Let universities and colleges become space for diverse opinion, dissent and sensitive to the cause of society, which will help India in creating an enlightened society. We must remember that youth will revolt against parochial and vicious ‘moral policing’ of all kind if allowed in the campus. Ambedkarites youths want a modern democratic republic of Dr Ambedkar’s dream and perhaps that is the biggest challenge for those whose dream a Manuwadi India. Rohith’s death has clearly shown the line that it is fight between Manuwad and Manavvad and you have to decide which side of ideology you wish to associate as your decision will make or break India.